My dear ladies and occasional gentleman, my day started with this……. A MOTHER’S DAY card, a lovely thought but I just wish I had shut the BATHROOM door before weighing myself! I have obviously scarred my darling son for life. In the afternoon my dear friend Veronica and I went to a MOTHER’S DAY VINTAGE TEA. As all our offspring were absent we went together and were treated to delicious savouries and fabulous cakes. 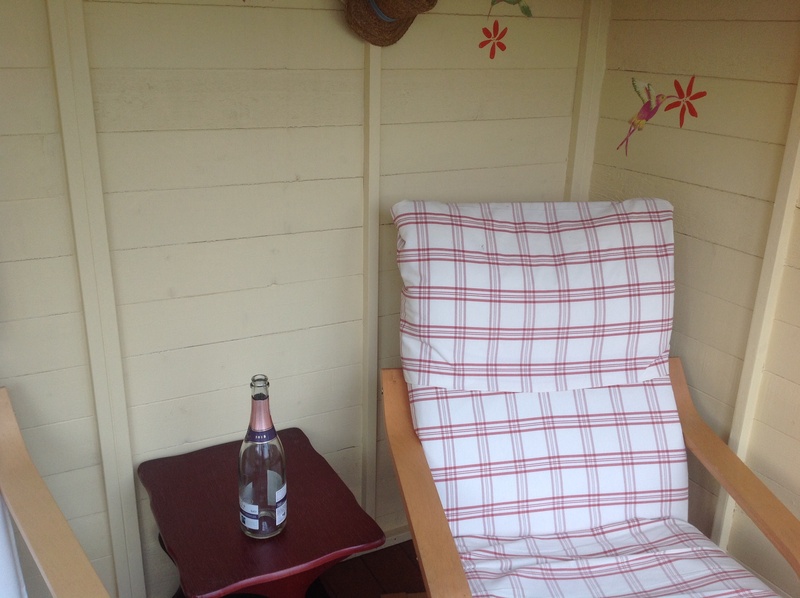 We WADDLED back to my lovely SUMMERHOUSE where Veronica pulled from her RECEPTACLE A bottle of SPARKLING PINK MUSCATO. Apparently it was a gift from a young SOAP KITTEN. We thought it would be rude not to drink it, so we did. There was a disturbing moment when Veronica declared herself a HERMAPHRODITE! I can only assume it was something to do with the PINK DRINK! The word just seemed to bubble up with the MUSCATO. There were a few moments of complete silence until we both collapsed with the giggles. My dear ladies and occasional gentleman, SHALLOTTS, it’s time to plant them. There is nothing tastier in your WINTER STEW than SHALLOTTS. If you PLANT them now, PULL them in the Autumn, PLAIT them and HANG them in your shed. you can enjoy them over the winter. All good so far but the problem lies in the fact I am still waiting for the garden in the front of the house to be fenced. Then I can have a RAISED VEGETABLE BED. So I had a little grumble to Ronald whilst showing him a picture of what was required and off he went to his shed. There was a lot of banging and screwing which Ronald is very fond of. So now we have the constructed raised bed, we just have to place it in the garden. Now I can see a fairly WEED free rectangle that looks perfect but no Ronald decides to place it the opposite way, against a hedge with the weedy ground sloping away and where I won’t be able to get around it. When the construction is in the right place Ronald takes a PICK-AXE and starts digging a long trench. “To fit the box in” says Ronald, starting on the next tench. “It will be fine trust me” says Ronald knocking the edges even deeper into the ground. 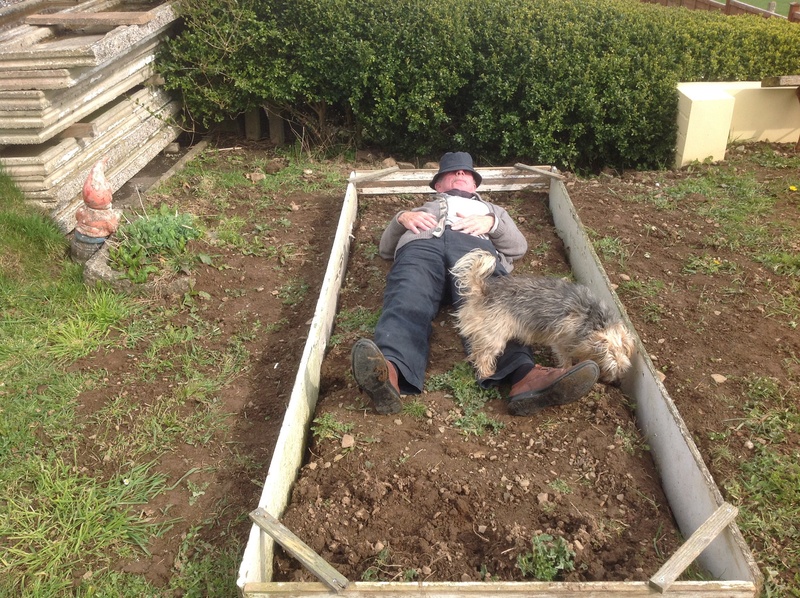 So now I have a SUBTERRANEAN RAISED BED as you can see here. AND THIS IS WHAT I PUT IN IT! LADYGARDEN STYLE, CONSIDERED BUT NOT COMPULSARY. My dear ladies and occasional gentleman, let us talk HAIRSTYLES. Shall we forget KIM JONG IL? The BABY-FACED GRIM LEADER LOOK is not very flattering is it? Let’s be honest who would voluntarily want the same hairstyle as young Kim, apart from SIMON COWELL of course. Which is presumably why it was sent out as a directive. So I am starting my very own trend ‘THE LADYGARDEN STYLE’. I can feel the VIBRATIONS over the MICROWAVES your EXCITED by the thought of it aren’t you? 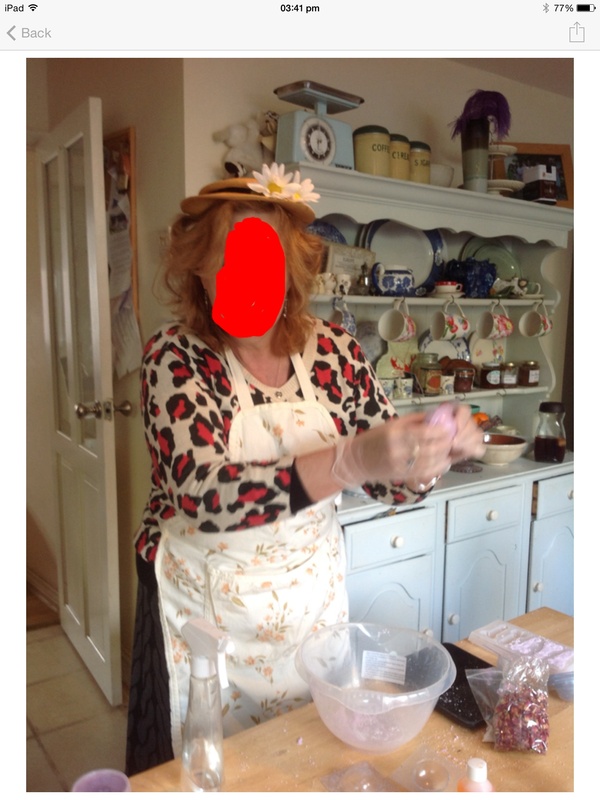 So here dear ladies and occasional gentleman is a picture of me ( oh yes it is) in my dear friend Veronica’s kitchen assisting with a little BATH-BOMB creativity. If you look carefully you will see my LOVELY LADY face has been painted out. This is so that you can put your own face in. Then HEY PRESTO you have a LADYGARDEN STYLE. So come on my dear ladies and occasional gentleman, JOIN IN THE FUN add your face onto my picture for your LADYGARDEN STYLE. My dear ladies and occasional gentleman, whilst writing to you I am also waiting for a call regarding number two DAUGHTER’s AUDI. Also I will admit to you that I am a sipping of a fruity little SAUVIGNON BLANC and it is only 3.20 in the afternoon. In my defence I have had a FRAGGLED day so far. It started last Tuesday, yes I know what you are thinking that is a long day. My daughter Morello had travelled down as her car needed some work for the MOT. On the way she stopped for petrol and as it was sunny put her ROOF down. As the ROOF went down there was a loud POP and her back window smashed, which was pretty scary. She had to return to work taking my precious FIAT 500 CONVERTABLE. So this morning Ronald and I had to take broken vehicle to the AUDI garage in the city about an hours drive away on a large INDUSTRIAL PARK. So I strapped little hirsute Roley into the front seat of Ronald’s BMW which I was driving and he was to follow me in the AUDI as I had the SATNAV. I programmed in the address and off we went. What was SHE doing? Well I don’t know because her screen was BLACK ! However she did take every opportunity to shout instructions at me! I made a left turn in order to turn around and head back, I pulled into a small turning and turned out to go back, Ronald pulled up tight behind me. I pulled out and up to the TRAFFIC LIGHTS and realised that Ronald wasn’t behind me. He had got out of the car to ask me where we were going and had to jump back in because I pulled away. The traffic lights were RED so I waited for him, then they changed to GREEN and a van pulled up behind me, I pretended to STALL until they went red again and Ronald had caught up. When I arrived at the left turning I wanted , NO LEFT TURN, so I drove onto a garage where I could turn again. I pulled back out into the road not realising AGAIN that Ronald had got out to chat about directions, too late. He had to jump into the Audie and follow as best he could. Madam wasn’t saying very much and didn’t say anything, when I saw the sign for the industrial estate, so I turned anyway because I knew that the AUDI GARAGE was somewhere there. SATNAV continued to give me SARCASTIC INSTRUCTIONS which I ignored and eventually in this HUMUNGOUS ESTATE I found the right place. I have decided that the SATNAV WOMAN is the sister of the woman in my FIAT who also has a STROPPY attitude. Why are these women like this, do men programme them specifically to annoy? MOTTE AND BAILEY BUT NO FREE RANGE CHICKEN! Good day my dear ladies and occasional gentleman and before you are thinking I have gone all ANTIPODEAN this was a COURTIESS greeting in past times in jolly old ENGLAND. Anyway as I was saying it was a normal Sunday morning in the LADYGARDEN household, SIR TERENCE WOGAN on the radio. When Ronald who was about to set forth for a FREE-RANGE CHICKEN for our Sunday Roast was diverted. Instead he strode with a manly stride to his SHED and grabbing the largest SPADE he could find set about digging up the LADYGARDEN PERIMETER. As you can imagine I was SURPRISED and INTRIGUED as to what was occurring. 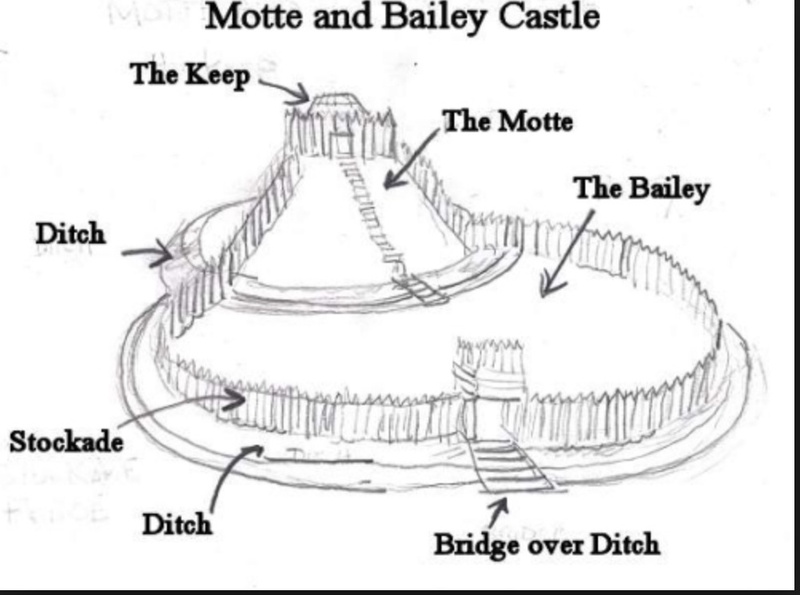 I stepped outside into the chilly wind to find Ronald DIGGING whilst MUTTERING about MOTTE AND BAILEYS and REPELLING THE HORDES and studying the picture I have shown here for your interest. With no sign of my FREE -RANGE CHICKEN! Re-entering the LADYGARDEN residence I discovered the meaning of Ronald’s strange behaviour. SIR TERENCE WOGAN was chatting about his forthcoming interview with the singer SAM BAILEY! ONE, SIR TERENCE WOGAN NEEDS TO ANNUNCIATE clearly. TWO, Ronald needs a HEARING TEST. Dear ladies and the occasional gentleman, what a lovely day . As you know I was meeting my dear friend Veronica for a LADIES LIGHT LUNCHEON. We decided we needed a little SEA AIR and made our genteel way to the SEASIDE. “What was this?” Veronica cried making an EMERGENCY STOP. After I had disentangled myself from my handbag and a couple of UNKNOWN ARTICLES that had shot over my head with the KINETIC ENERGY generated by the enforced stop. The road to the SEASIDE was closed! How very annoying! But have no fear my lovely ladies and the occasional gentleman, there is always another way. Oh that first glimpse of the WHITE HORSES galloping to shore and washing over the golden sand. It lifts your HEART, the OCEAN. After parking the car our first stop was the CHARITY SHOP and I was thrilled to find a 1980’s KNITTING BOOK, I know you are all jealous. We then went to a SEAFRONT GALLERY with all sorts of interesting GOODIES. We had a pleasant chat with the lovely LADY PROPRIETOR. Although I was a little disconcerted when talking about her stock, she said “I’VE GOT A 6 FOOT HORSE OUT THE BACK” and thought it was time we left, Veronica’s TUMMY was doing THE SAILORS HORNPIPE by this time which meant lunch was due. We entered the delightful TEA-ROOMS and Veronica glancing to her right said to the poor innocent man lunching with his wife “OH WHAT LARGE SCONES YOU HAVE!” Before his wife, who was looking a little cross at this remark could reach Veronica, I steered her away to a little table the other side of the room. We were sharing a delicious POT OF TEA when we were joined by a little girl of about 3. from the next table. Who unfortunately had the same dress on as Veronica. I do believe a mature women has to be a little cautious about DENIM. Of course Veronica was hoping she would move away but the little girl decided she had an IMAGINARY FRIEND in the chair next to Veronica. I thought they looked quite sweet together, she was like a MINI ME Veronica. I don’t think Veronica thought it was sweet. This morning I had an e-mail from ED BALLS. Now I don’t want you to think that this is a regular occurrence. We DO NOT COMMUNICATE regularly, He is not my friend on FACEBOOK. This e-mail came OUT OF THE BLUE. Is this designed to install a NOTION of CHUMMINESS? Is he trying to be CASUAL? Or FRIENDLY? Is this what we must now expect from our POLITICIANS? I don’t think TONY BENN would have e-mailed me in this casual manner. Anyway what ‘ED’ wanted, was to know if me and my family were BETTER OFF under this government and there were two BUTTONS to press, one marked YES and one marked NO. He said WAGES have gone down by £1600 a year under this government. Looking at ED’S picture, I don’t think he has had to go to any FOOD BANKS lately! After the sign off ‘ED’, was another BUTTON marked DONATE……..
Well quite clearly I had misunderstood this message. ‘ED’ obviously was feeling THE PINCH! He was asking me for a LOAN! In CONTRAST I received a delightful POSTCARD from my granddaughter, addressed DEAR GRANNY and SIGNED with love. She hasn’t the benefit of a PRIVATE EDUCATION but at HOME and at her STATE SCHOOL she has been taught MANNERS and COMMON COURTESIES. I WILL be RESPONDING to my granddaughters POSTCARD but I WILL NOT be PUSHING EDD BALLS BUTTONS! Oh dear! My dear ladies and occasional gentlemen, it has been a funny old day. It started well when my dear friend Theresa called for her plants. It is her BIRTHDAY so we had a lovely chat and I gave her a little present of some KNITTED SLIPPERS and a card. Ronald popped into town and bought a CHICKEN announcing that he would cook dinner. I prepared the potatoes whilst he was away and then sat at my lap-top to do some more FAMILY RESEARCH. Ronald started cooking at 12 MID-DAY, there were lots of questions regarding cooking times but it all started to go wrong when he thought that 90minutes was 1 hour 10 minutes. Now he is an intelligent man but when it comes to COOKING his brains seem to go for a walk. There was lots of banging and clanking and the oven door must have been opened and closed about 20 times. Then Ronald appeared with about 60% of his Moustache shaved off, presumably with a CHEESEGRATER as it was so patchy. Why would you SHAVE your MOUSTACHE in the middle of cooking dinner? At 4 o’clock I went into the kitchen and made the GRAVY. The dinner finally arrived at 4.35. It was DELICIOUS! But whilst eating it was difficult to control the giggles when facing a partially hirsute CHEF! DISTRACTION, WHITE WINE & TUNA. What a beautiful day apart from the chilly wind it has been. I thought I might chance it and plant some SUMMER BULBS but I was distracted and found myself moving a small unknown TREE in a pot to the side of the front door. Which made me think of the ROSE I bought when my mother died and wanted to plant in a metal planter of hers, to sit on the patio. When I looked in the metal planter which I thought was empty I found some TREE LILLY bulbs that came from mums. So I decided to get them in the ground as they were starting to shoot. Which made me fetch the fork and dig up an ORNAMENTAL GRASS ,to make room for the LILLIES but realised there was room for a ROSE cutting that I had taken last year and now needed planting, which I did. The ORNAMENTAL GRASS I popped in a tub for my dear friend Theresa. Which made me remember the HELLIBORE I had promised her, so I dug that up too and popped it into a tub. By which time I decided I had done enough so sat in the SUMMER HOUSE with a glass of WHITE WINE and a TUNA roll. Sometimes I think I am a slave to DISTRACTION!